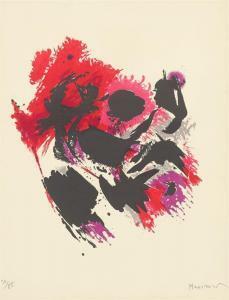 Find artworks, auction results, sale prices and pictures of Alfred Manessier at auctions worldwide. Alfred Manessier (Saint Ouen 1911 – 1993 Orléans) „Alléluia\“ / „Les 3 Clous\“. 1965/1966 2 Farbserigrafien, jeweils auf Rives-Velin. 55 × 45,5 cm (76 × 54,5 cm) bzw. 50 × 66 cm (55 × 75,5 cm) ( 21 ⅝ × 17 ⅞ in. (29 ⅞ × 21 ½ in.) bzw. 19 ⅝ × 26 in. (21 ⅝ × 29 ¾ in.)). Jeweils signiert. Jeweils einer von 120 bzw. 140 nummerierten Abzügen. Zürich, L'Œuvre Gravée, 1965 bzw. 1966. HINWEIS: Telefonische Gebote sind für dieses Los nicht möglich. 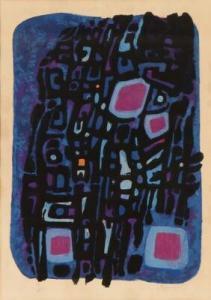 Alfred Manessier (Saint Ouen 1911 – 1993 Orléans) „Alléluia\“ / „Les 3 Clous\“. 1965/1966 2 colour silkscreens, each on Rives wove paper. 55 × 45,5 cm (76 × 54,5 cm) and 50 × 66 cm (55 × 75,5 cm) ( 21 ⅝ × 17 ⅞ in. (29 ⅞ × 21 ½ in.) and 19 ⅝ × 26 in. (21 ⅝ × 29 ¾ in.)). Each signed. Each one of 120 and 140 numbered prints. Zurich, L'Œuvre Gravée, 1965 and 1966. PLEASE NOTE: Bidding by telephone is not possible for this lot. 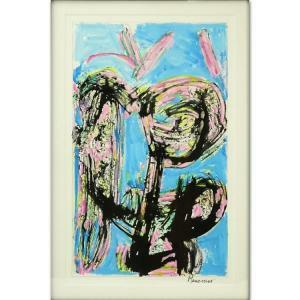 Alfred MANESSIER (1911-1993) Untitled Lithograph in colors on Arches paper Signed in pencil, artistâ€™s proof (annotated Ã©preuve dâ€™artiste) on lower left and dedicated to Eric Mourlot on lower right, printed by Mourlot, Paris Artistâ€™s Edition 19.5 x 15 in. â€\“ 49.5 x 38.1 cm. 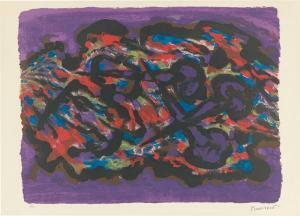 Alfred Manessier (1911 - 1993) Lot 196: Alfred Manessier, French (1911-1993) Gouache on paper "Composition". 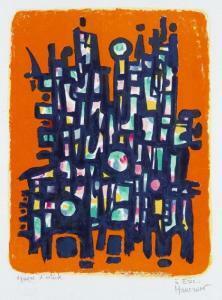 Description: Alfred Manessier, French (1911-1993) Gouache on paper "Composition". Signed lower right. Creases or in good condition. Measures 20-3/4" x 13" (sight), frame measures 25-1/2" x 17-3/4".